Note: For tips on driving during bad weather, read our blog here. Tip #1: Always check the oil, even if you’re in a hurry. Tip #2: Always check the fifth wheel connection with a flashlight to ensure that the jaws are locked behind the kingpin – especially if you’re returning to your unit after a period of absence. Tip #4: Always reverse into a parking space. You can always drive out if you reverse into a parking space, but you can’t always reverse if you drive in. Tip #5: Use the ‘three points of contact’ rule for getting in and out of your truck (i.e. use two legs and an arm, or two arms and a leg). Tip #6: practise caution when you open the doors of the truck: first open them a crack and peek in. If the freight has shifted it could fall out and hit you on your head. Tip #7: If you are able to, always reverse in on the sight side. Tip #8: When executing a U-turn, ensure you always make it as wide as possible. If it is quite tight, move slowly. If you make a circle turn, do it in the direction that ensures you keep obstacles on the sight side. Tip #9: On asphalt or other soft surfaces, place boards under the trailer dollies. Tip #10: If you drive a truck with an exhaust stack near the driver’s door, wear ear protection. Tip #11: Always visually check the height of a trailer before backing under. Tip #12: If you have to drive a truck with which you are unfamiliar, check the fuel level. If you are still not sure, dip the tank. Tip #1: Look at your map and determine from which highway, freeway or interstate you will be coming into your destination. Tip #2: Call the receiver and get directions from the person with whom you’ve been dealing (e.g. the shipper). Tip #3: Go back to the map in your truck. Look at the city inset and see if the directions line up with the map. If not, call the shipper again and ask for clarification. Tip #4: Write out the directions in a short-hand that you can refer to while driving, without needing to pull out the map. Do this as soon as you know where you are headed so you needn’t look at your GPS while driving. Tip #1: Follow the rules. Don’t cheat the system. Be smart for your own safety, others on the road, or your company’s reputation. Tip #2: Don’t speed ever. 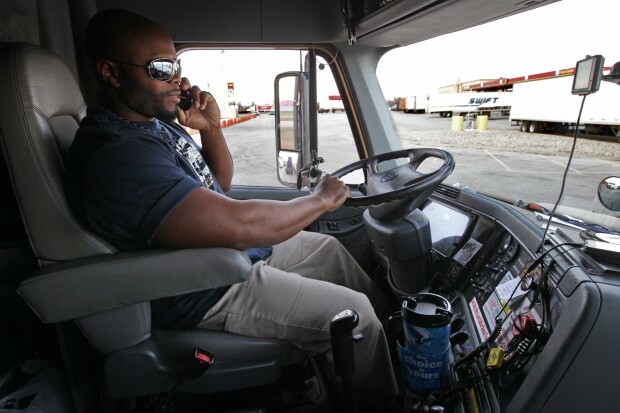 If you’re in your first year of truck driving and receive a fine, it can be pretty difficult to find a job afterwards. Tip #3: Don’t make split-second lane changes. Make sure your indicator flashes for a decent amount of time before you move. Tip #4: Be nice to everyone with whom you deal – they’ll make the effort to return the goodwill. Most of us know the cliché of the long-distance truck driver – overweight, pasty, and a big lover of all kinds of junk food. You don’t have to embrace the stereotype. Tip #1: No matter what, find time to exercise just 15 minutes every day. It doesn’t have to take place in a gym, and you don’t have to have a regimented plan. Tip #2: Make each workout a vigorous one. Try maintain your maximum heart rate for 75–85% of the time. This maximises fat burning, and more importantly, your time. Tip #3: Work multiple muscle groups simultaneously. Combine several exercises to ensure a total-body workout. Tip #4: Always eat after working out. Eating 20 grams of fast-acting protein (e.g. whey isolate powder) within 30 minutes of exercising is best if you want to build muscle. Tip #5: Never skip breakfast – and then eat every three hours. This will keep hunger at bay and prevent binge eating. Tip #6: Keep healthy snacks handy. When you are travelling, you tend to eat whatever is available (and convenient) so make sure you only have good food available. Tip #7: Keep a log of your nutrition and fitness. Keep a daily food and exercise journal, and you’ll find it easy to spot weaknesses.